The past weekend was full of baseball! Leksand Lumberjacks was visiting Gothenburg in the Elitseries. A beautiful day where the games was preceded by the national anthem and the ceremonial first pitch. A lot of people found their way to the Shark Park which was offering both sun and some occasional clouds! The spectators could not only enjoy the weather but also some good pitching from both teams. Even though the game was not as tight as a Shark fan would have hoped, it was an exciting one where the Sharks failed to produce enough runs in the end. Even though it wasn’t the failing factor in this game, the defense needs polishing. The Sharks seems to have problems producing the extra sharpness and have the quicker feet when needed for the final out. The passiveness or perhaps choosing a play with a lot of margin let Leksand on base a few too many times. Game two featured pretty much all of the Gothenburg pitching staff available. Coach Anders did what he could to keep the arms fresh not letting each of them too many innings. Even though the runs let was a few too many, two runs scored is not enough to win a game on this level. Game one ended 6-1 and the second game ended 12-2. Both games in favour of Leksand. A well deserved win according to how the game was played. The Gothenburg team in the second division welcomed Malmö Pilots to Shark Park on the two Sunday games. The Gothenburg team featured youngsters,old timers and up and coming players who all share the love of the game. Malmö showed off some good pitching and a tight defense which made it hard for the Sharks to get on base. Malmö capitalized on some mistakes made by the Gothenburg defense but must be given the credit they deserved for their hot bats. Brian Jordan with the Pilots left the game 8 for 8. The first game of the day was a tight one. The game ended 2-0 to Stockholm. Jacob Claesson with the Stockholm Monarchs pitched all nine innings not giving up a single run. The Sölvesborg pitcher Eddie Aucoin gave up the game losing run in the forth. If game one was tight, game two was totally the opposite! Sölvesborg started out fine with a two run lead, but Stockholm took over after that. Karl Knutsson started off with the pitching and was relieved by Mathias Person for an inning. Karl then entered the mound once again, but failed to produce the energy to stand up for the Stockholm offense. Rickard Ödmo took them to an early finish in the sixth where the game ended 5-20. Stockholm is still undefeated but was challenged for the first time in game one. The Karlskoga Bats was coming from back to back losses versus Leksand (0-10 and 1-2) and Sundbyberg on the other end was 2-0 versus Sölvesborg (1-17 and 4-7). The Bats took their first win of the season in game one but came up short in the second game. That puts Karlskoga one win ahead of Gothenburg. The Bats are off to Stockholm next. Sundbyberg won todays game over Akademin comfortable 16-5 (7). The Sharks will head for Sölvesborg on Saturday. Both teams are looking for their first wins of the season and someone will break their track record. Exiting weekend coming up. The next home game is May 24 when Sundbyberg is visting Shark Park! This entry was posted in Baseball and tagged Akademin, Gothenburg Sharks, Karlskoga Bats, Leksand Lumberjacks, Malmö Pilots, Sölvesborg, Stockholm, Sundbyberg Heat on May 14, 2014 by Marcus. It is time for the final game of the regular season! The Sharks are heading towards Sundbyberg to wrap up the season. Sometimes the games matters everything, sometimes not. This is one of the latter games. Even with two wins the Sundbyberg Heat can’t pass Leksand since they are on the same amount of wins and the tie breaker is the winner of the last game between them. Sundbyberg won the first game in the double header and Leksand the one that matters, the last game. The Gothenburg Sharks could pass the Akademin with two wins. The Sharks are one game behind but the Akademin won the last game between them. The Akademin ended their season with the double header in Gothenburg on the national day, June 6. They play half the season. Regardless, that will only affect the position in the series. The Sharks will still have to play quallifications games to stay in the highest league. Gothenburg did not catch any breaks in the games versus Karlskoga home, nor Leksand away. They were closer the first game and lost big in the second, both times. Since Kerry got injured after pitching 120+ pitches in one game early in the season the Sharks have had problems with pitching and releaf. The bullpen is simply not deep enough to go two full games in a series this season. With that said, I’m happy to see that both Ted and Hiba are going to Sundbyberg tomorrow. Ted (18 yo this year) have been too eager to pitch and play and haven’t caught up with his basic training and have been injured back and forth the entire season. Hiba is another of the younger pitchers available (20 yo). Hiba started the second game versus Karlskoga two weeks ago and pitched six full innings. He did have some trouble commanding his pitches but overall I was impressed by Hiba. He did last six innings, he did strike out batters and he do got a few different pitches availble to him. Just get some more coaching during the games, some more innings pitched and he will become one of the corner stones in the Shark pitching. 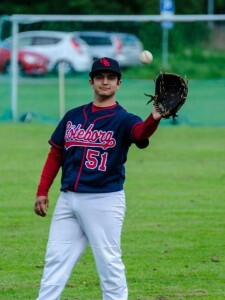 Ted pitched 1.2 innings in the second game versus Leksand last weekend. He started the first game away versus Stockholm May first, pitching three innings. He also pitched two full innings in the second game versus Sundbyerg almost a month ago. I hope that Ted could start taking care of his training and continue to develop as a pitcher and of course at bat so that we could see Ted play more games with quality pitching and no injuries. Those are the two I will follow closest tomorrow! Best of luck in the last double header of the regular season! This entry was posted in Baseball and tagged Akademin, Gothenburg Sharks, Sundbyberg Heat on August 9, 2013 by Marcus. The Acadamy, the high school students specialized in baseball got one team in the highest league. The Sharks was supposed to open against The Acadamy in April. That game got postponed due to field conditions. What more could one ask for but 20 centigrades and sun mixed with some clouds and dry field conditions? The Sharks started immediately to gain ground and did their first scoreless inning in the fifth. The Acadamy showed an impressive moral and did not give in. They scored no less than eleven runs in the three last innings of game one. The Sharks failed to respond to that massive run party but got up on the board on the last two innings. One could feel the dropping moral of the Shark players in the end of the first game. Did they have it in them to turn the game around? The Acadamy wanted the second game and wanted it bad. After a fly out start they started to grind runs for the next four innings. The Sharks took some time to get up on the board and had trouble scoring runs. They managed to score two runs and got them late in the game. Simply wasn’t enough to threaten the Acadamy and to keep the game until more than seven innings. The Sharks will head to Alby for a double header on Sunday. Afterwards it’s time for some well deserved vacation to recharge the batteries, do some extra batting and fielding practice to get some good momentum going into the second half. It it is obvious risk that we’re heading towards qualifying games for staying in the Elitserien at the end of the season. We do need to get something going prior to that. There is plenty of time for that though. This entry was posted in Baseball and tagged Akademin, Gothenburg Sharks on June 6, 2013 by Marcus. The double header versus Stockholm today exposed Shark baseball where it is today. My predictions that we were past easy mistakes and being stressed out at plays was wrong. Stockholm got us right where they wanted us. They showed off a good defense where the Sharks did not get anything easy. Stockholm offered almost no mistakes and what could be called a solid defense which the Sharks failed to go by. I tried to argue that there was something going with the Shark offense that wasn’t really out there yet. That did not show today. Stockholm Baseball almost shut us down completely. The solid pitching of Stockholm was too much for us. One can’t really blame the bottom of the Gothenburg batting order that got struck out looking too often. The other parts of the team wasn’t there to threathen the pitchers nor challenge the defense. That combined with almost no mistakes from Stockholm produces the offensive figures of the Sharks today. Two runs after fourteen innings. Stockholm scored 30. I’m not sure there is anything to learn from todays games. The team just need to step up defensively and back up one another. When error situations do occur, be there to backup the plays. Take the full defense job and run the extra meter to be the back up. I guess it all comes down to practice more together. Minimizing the errors and when all else fails, score runs! Checking around what happened around baseball today in Sweden we got two victories from the Karlskoga Bats playing Alby away. The first game ended 3-15 (7). The other game was probably rain shortened 1-8 (5). Leksand and Sunbyberg shared one win each. First game to Sundbyberg 7-10, then Leksand bounced back winning 8-4. Todays most surprising moment was when I realized that Leksand made it to Twitter! I’ve been looking for updates from that part of Sweden for over two years and I seriously started to think that they didn’t have internet. We applaud them and are looking forward to more updates! The Gothenburg Sharks needs to get todays losses off their shoulders quickly. On the national day of Sweden, on Thursday we are welcoming the Akademin to Shark Park as the last game before the summer vacation. Subscribe to the calendar to make sure you are up to date! 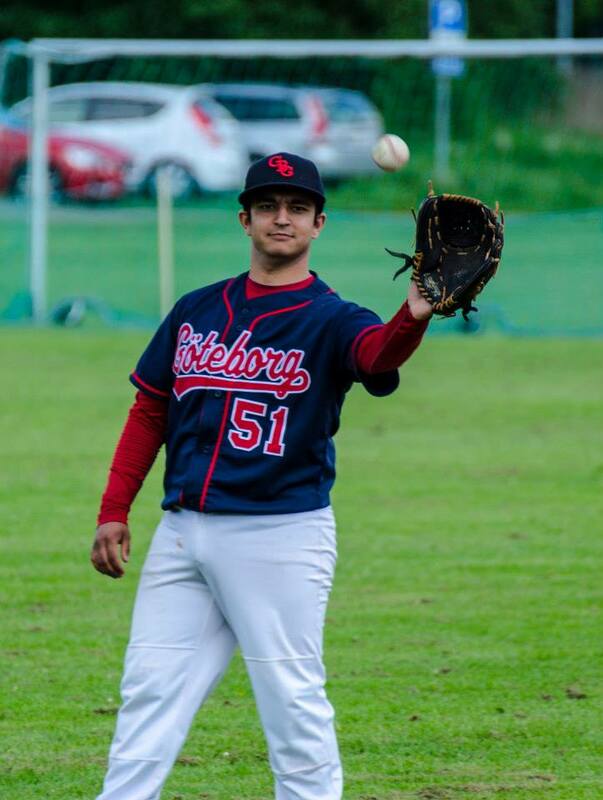 This entry was posted in Baseball and tagged Akademin, Alby Stars, Gothenburg Sharks, Karlskoga Bats, Leksand Lumberjacks, Stockholm on June 2, 2013 by Marcus. It is sad, but the home opener will have to be postponed. The section of the city that is responsible for the field inspected it today and denied games until at least the first week of May. Despite the bad news of the opening day, something good came out of the meeting. The city committed to do some work on the drainage which will hopefully lead to a better field the rest of the season. This means that the first game of the season will be away versus Stockholm at Skarpsnäck May first. This will also be Stockholms first game of the season. Two years ago, the Sharks played Stockholm in a double header away on May 28. The first game was lost to Stockholm 3-0. The second one only went to eight innings and a 4-14 win for the Gothenburg Sharks. Andreas Wahlin scored four runs and Sami Säkkinen drove in four runs. Stockholm was charged with seven (!) errors. The final game of the season was also played there. The Sharks fell short in that game and Stockholm won the title and the Sharks got the silver medal. The home opener will be May 11 versus Alby Stars at Shark Park (as seen in the Calender). The Shark organization has saved something special for this. It was actually planed to be the official opening day since a while back. It will offer the ceremonial first pitch by a celebrity and of course a double header. Hopefully the field will take the opportunity to soak up the coming two weeks to be ready for some ball at May 11! This entry was posted in Baseball and tagged Akademin, Alby Stars, Gothenburg Sharks, Stockholm on April 24, 2013 by Marcus. The Swedish Elitseries is about to start, but is the weather cooperating? Latest report from Shark Park is not really comforting for a fan of baseball. Although it is getting better by the hour, rain is expected during the week and the field can’t take much more if there should be a season opener the upcoming weekend. It will be a battle against time. There are no particularly good extra dates available so everyone could expect that the organization does what it can to get the field ready for some ball. Especially the right out field is slippery wet/drenched. We expect updates several times during the week. Keep an eye out for the forecast over Partille. According to yr.no we’re looking forward to a sunny weekend at least as of now. This entry was posted in Baseball and tagged Akademin, Gothenburg Sharks on April 22, 2013 by Marcus. Domarcupen (Umpires cup) is hosted by the Karlskoga Bats and played 20-21 of April. This is just the week before opening day. There will be two groups and Gothenburg Sharks will participate with one team. Each team will play at least 3 games. Gothenburg is in group B together with Karlskoga I, Oslo and Akademin. Group A is Enskede, Karlskoga II and Alby. Gothenburg will open versus Oslo on the 20:th 12:00. Second game is versus Karlskoga I starting 18:00. The next day Gothenburg will face Akademin at 16:00. The final is played at 18:00 where the winners in each group will play one game for the title. This is the pre-season games that are scheduled before opening day. We guess that the last thing haven’t been said about the weather just yet, but we’re looking forward get this season started. This entry was posted in Baseball, Elitserien and tagged Akademin, Enskede, Gothenburg Sharks, Karlskoga Bats on April 8, 2013 by Marcus.